Your Cleaner is a Free Portable PC Cleaning and System Optimization Tool that can be used to help keep your your computer clean and running like new. The tool can remove traces of online activities including Typed URLs, Download History, Cache, Cookies, Auto Completion and Saved Passwords. 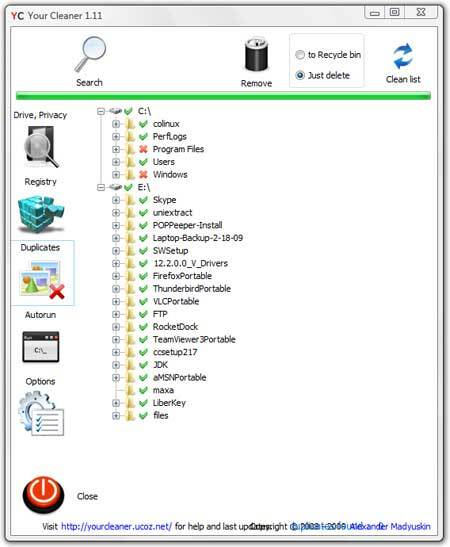 Your Cleaner can also remove temporary files, clean and optimize your system registry and remove duplicate files. Moreover, an autorun manager is included that enables it’s user to disable or enable programs that run at startup. Note: Once you have Your Cleaner.exe on your USB device, you can uninstall the software from your PC.